Next pour in the wine that should cover the rice and let it evaporate completely. Once the onion and rice are dry start pouring in the stock in small amounts, even a ladleful or two at a time stirring the risotto base all the time. When each addition of the stock has almost evaporated then is the time for the next one (again a ladleful or two, never too much). Once the grains are ready and soft (al dente) turn the heat down and wait a minute. The last step is to add the diced cold butter and the grated cheese beating it vigorously together (very important) while shaking the pan. Season to taste. I like to cover the pan with a lid and let it rest for no more than 2 minutes but of course you can serve the risotto immediately decorated with some grated cheese and toasted hazelnuts. *Castelmagno cheese is a dense and crumbly cheese from the province of Cuneo that is milder when young but develops some spice when it ages along with a blue mold. 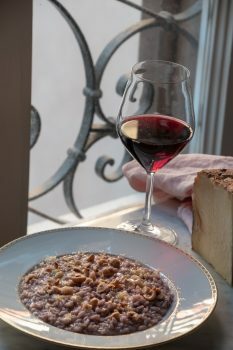 *I am more generous with the red wine proportions to the white one in this risotto. I love the depth of colour and the taste it gives to the rice.